Aberthol looked somewhat troubled by the Banette's comment, despite it most likely not being his patron. "Honestly, I personally think Shaymin is neat. It's awfully cute and can help get rid of pollution like Suicune. So I would have totally been hyped to have that as my patron legend. I can kinda tell that it's not my actual patron though." The pale haired boy commented, "But that's just my opinion. Feel free to have whatever opinion you want." Horace just sighed and stared off into the distance. He was mainly thinking about what legend would have chosen him. Would he and his brother be part of a trio of legends together? Would they ever be as close as they were before all this? And would Aberthol still visit or travel with him if they had to split apart? Seeing as their body shape didn’t lend itself as well as others to ‘sitting’, Neurese had instead settled for hovering slightly off the ground at the table with the rest of the ‘Chosen’. They hadn’t exactly known much about what was going to happen when they accepted, so they had stayed silent in hopes of trying to process it all. They wondered who their patron was. It seemed as though some of the others at the table already knew, but they personally had no idea. "My name's Dust," the Sableye said, grinning. "I bet your patron is... Hmm, I don't know, Phione? Phione's pretty awful." He stuck his tongue out and wondered what his own patron was. He was pretty sure it was Arceus. Maybe Genesect? Genesect was purple. Dust was also purple. A Delphox politely entered. Upon noticing the oshowatt, he ran over to her and picked her up. "Hey Honey! How are you?" "Great, Dad! THis whole legendary stuff is really cool!" "Great, honey." "Where did those bruises on your head come from?" "Uh.."
With no reply coming from the oshawoot who was now being carried by a Dephlox, he sinks in to his seat. He pulled his beanie down and tried to take a nap to ease out his uneasyness. The whole 'pateron' thing was taking a long time, surely a nap wouldn't hurt. Soon, the Oshowatt and Delphox were sitting next to each other. It was obvious they were related.. but how? 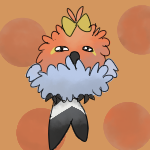 Thanks to Alex weilding the stick, it was unknown of the Delphox's gender. However, for anybody siiting at the table, the Oshowatt yelled. "HI GUYS THIS IS MY DAD. ISN'T HE COOL? A DAUGHTER AND FATHER BECOMING LEGENDS? LET ALONE THE SAME REGION!" The delphox sighed. "Alex, calm down. Youre getting hyperactive." The yelling was scaring Robin. He put his head down on the table and covered it with his hands, as if he was waiting for a bomb to go off somewhere nearby. When would the Legends come in? Nonagon glanced back at the Mew. Was this real? The Porygon-Z was unable to dream, so unless their systems were somehow functioning even worse than usual, this had to be real. This was... interesting. They took an empty seat at the end of the table. They gently hovered above it until the electromagnets helping them hover turned off suddenly. Ah... how long would they be stuck like this? It was a little overwhelming. Nyx wasn't too sure on all of this. Being a patron of a Legend was most definitely not something she had signed up for, nor was too interested in. However, she was curious. The Zorua scanned her eyes over the various Legendaries in the room, wondering which one had decided to pick her. She turned her attention back to the other Chosen. It was certainly a little... chaotic. There was a bit of yelling and some Chosen were milling about elsewhere. Nyx continued to stay seated at her spot on the tabel, not wishing to get too involved. This wasn't the best situation she wanted to be in. Ford tried to sleep as much as possible. The yelling didn’t helped at all. He cowered in his seat as he distanced himself from the noise. When was this bad dream going to end? Dewdrop looked over at Ford. He seemed really upset, too. Maybe she could help him feel better like the mew had helped her! "a-are you okay?" She asked, her voice an ice-melt in the torrent of sound. She put a flipper on his head, and patted him. She wasn't really good at this, but she could try.